Rachmaninoff's Vocalise has been arranged for cello solo and piano by Valter Dešpalj, professor of cello at music academies in Zagreb and Liechtenstein. A graduate from the Juilliard School, Mr. Dešpalj studied cello under Leonard Rose and chamber music with Felix Galimir and the Juilliard Quartet. Mr. Dešpalj has performed all over the world, held guest professorship at conservatories throughout Europe, and been an editor of cello music with major music publishers. Rachmaninoff's Vocalise, originally composed for voice and piano, has been warmly embraced by many string players. While traditionally played in the key of E minor, this edition offers a transposition in C minor. The inspiration for this choice came to me while listening to Anna Moffo's legendary recording (with Leopold Stokowski conducting the American Symphony), where she sings in that key. Her dreamy and deeply moving expression, very slow tempo and indeed the unusual tonality, make her interpretation very special. The C minor alternative, played in the cello's lower register with frequent crossings between the A and D strings, provides for more color and depth. This enhances a nostalgic atmosphere of the Vocalise and complements the essential character of the cello. 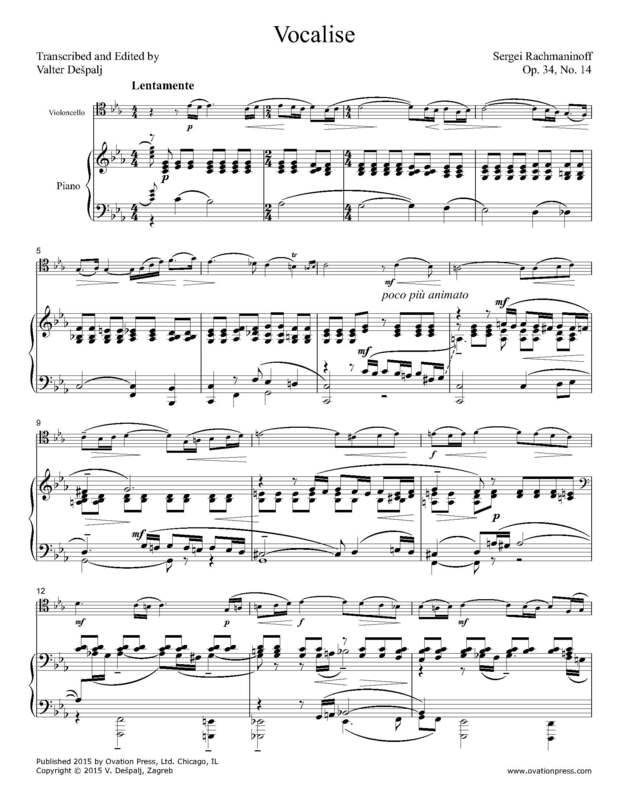 Download and print the score today to gain access to this expertly edited arrangement of Rachmaninoff's Vocalise for cello and piano by Valter Dešpalj!